Sir Henry Percy and Elizabeth Mortimer. 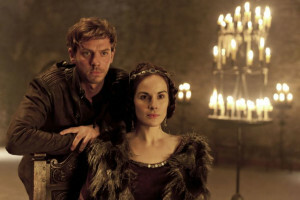 For those readers who have a keen enjoyment in following the adventures of the Tudors, is there any connection between this famous pair and the Tudors? Elizabeth was very much a Plantagenet. Great-grand-daughter of King Edward III, Elizabeth inherited her royal Plantagenet blood through her mother Philippa, daughter of Lionel Duke of Clarence, King Edward III’s second son. Philippa married Edmund Mortimer, third Earl of March. This placed Elizabeth in the centre of the struggle for power for the throne, by the Mortimer claimants, after the death of King Richard II and the usurpation of King Henry IV. All royal cousins, this makes Queen of the North a compelling family saga of power and treason, of betrayal and death. The Mortimer Earls of March had a strong claim to the throne even if it was through the female line of Philippa of Clarence. Nor was Hotspur without his own royal connections. His grandmother was Mary, daughter of Henry, Earl of Lancaster, who was grandson of King Henry III and first cousin to King Edward II. Sadly we have no contemporary images of either Hotspur or Elizabeth. Nor are there any written descriptions. It is a matter for our imaginations. This is Joe Armstrong and Michelle Dockery playing the roles in Shakespeare’s King Henry IV Part One in the BBC Hollow Crown Series. I think they look just right! What connection, then, does this dynamic couple have with the Tudors? At first glance, none, since they lived their dramatic lives in the first turbulent decade of the fifteenth century. Elizabeth Percy, only daughter of Elizabeth Mortimer and Hotspur, married as her first husband John Clifford, Baron Clifford. One of their daughters, Lady Mary Clifford, married Sir Philip Wentworth of Nettlestead in Suffolk. Mary and Philip’s son, Sir Henry Wentworth, wed Anne Say, the daughter of Sir John Say and Elizabeth Cheyney, by whom they had two sons, Richard and Edward, and four daughters. Here comes the vital connection. One of these daughters, Margery Wentworth, married Sir John Seymour ofWulfhall, Savernake Forest in Wiltshire. They had ten children together. One of these children was Jane Seymour, who famously became the third wife and thus queen consort of King Henry VIII. She was mother of King Edward VI. 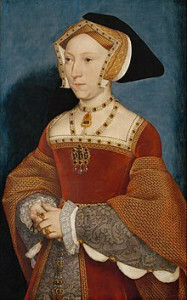 And of course we do have a contemporary portait of Jane Seymour by Hans Holbein the Younger. Thus the far distant Plantagenet blood of Elizabeth Mortimer and Sir Henry Percy ran through the veins of Jane Seymour and her young son. Elizabeth Mortimer and Hotspur provide a splendid story for us in their own right, offering a marvellous window into the ambitions of medieval power-hungry magnates in the years before the Tudors came upon the scene. No less fascinating for all of that. All to be enjoyed in Queen of the North. Stop Press for a new book for August 2019 Why was I inspired to write about Elizabeth Mortimer? As always really looking forward to your new novel. My only wish is that you write even more which, I know, is an impossibility as you wouldn’t have time to sleep. I already have Queen of the North with its gorgeous cover. Just commenting to let you know how much we appreciate your writing and also hoping that one day I’ll own a signed copy of any one of your novels. Thank you so much Anne for the pleasure you give us. Always very much in earnest for your next one. I have read all of your books except Queen of the North and would love to win a copy. Medieval history is so interesting I can’t move on to another era in history it just keeps you honed in at all times. Love it! I would love the paperback edition please. I thoroughly enjoy reading history books and the Tudors were my favourite era but I have been expanding over the last few years. I would love to have a signed copy of Queen of North. I’ve enjoyed all your books and I’m now looking forward to reading the Queen of the North! Can’t wait to read Queen of the North, and especially learning of the Tudor connection. Winning a copy would be wonderful. A joy to read. Wonderful, wonderful! I get so lost in your wonderful, descriptive and exciting books! 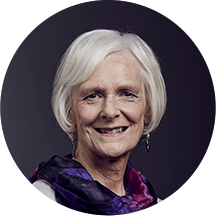 I haven’t read Queen of the North as yet, so I am hoping I might be lucky winning, fingers X.
I have read all your books to date and am looking forward to reading the Queen of the North. I studied Medieval history A Level many, many, many years ago and this time in history still holds a strong fascination for me. Coming from Bedfordshire not two miles from where Margaret Beaufort was born. Also not far from Yardley Hastings where Elizabeth Woodville has connections but also 25 miles from Foutheringay where Cecilly Neville is buried with her husband, Richarcd Duke of York. 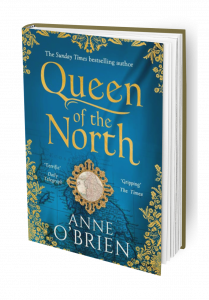 I would love to be lucky enough to win a copy of the Queen of the North! I adore royal genealogy. Your books are so good. I haven’t read Queen of the North yet. Would love to win a copy. Thank you! I have not read this book yet and loved reading your other books! I absolutely LOVE your books and can’t wait to read the next one. Fingers crossed. x Keep up the great work. I started reading historical novels on the Tudors, but have discovered I much prefer the Plantagenets! I hope I win the book. I love reading your books, they are so compelling they really transport you back to the time period. I’d love to win a signed copy to cherish. I have read all of your books. I can’t wait to read this one. I love the tudors and I didn’t know of the connection. I love of all things medieval England. Having been born in Huntingdon and adopted to U.S. citizen parents, I never got to live in a land so steaped with history. I hope to someday travel there, but for now I read and watch everything and anything I can on England. I am excited about your new book! Really enjoyed this book, would love a signed copy. Thank you for the chance. Thanks for the chance! I am not certain if US residents are eligible….but ….congratulations! As an Anglophile I would love to visit Ross on Wye, maybe I will be able to,one day! Love historical books & especially the Tudor’s. Would love a copy of your tempting book. I really enjoy your books because you tend to move away from the overworked areas of Henry VIII and Elizabeth I, and it is so refreshing to delve into other richer seams that haven’t been worked out. Eeeekkkk! This is my next buy on the must have list. I would love a copy of this book. My hubby thinks I’m nuts as I’m so fascinated by all these long gone people but when I read about them it’s like travelling back in time to a place in which I feel very comfortable. Have read all your books except Queen of the North, really looking forward to reading it soon. Am very interested in Hotspur and the Mortimers. I’ve studied the Tudors and never known of this Plantagenet connection! Something I love about Anne’s novels, just how she brings these fascinating people, previously just names in a family tree, to life who had thoughts and feelings just like you and I. I’ve yet to read Queen of the North. Of course winning one would be great, but either way I’ll be reading it! So, a better claim than Henry then! Love to read this. Wow I never knew this about Jane Seymour! This is so interesting. I’d love to win the book to be able to read more about these great people. I didn’t know of the Tudor connection, you learn something new every day! I haven’t read Queen of the North yet, so would love a copy. Hoping you pick me. Fingers crossed. I have loved the Plantagenets since my high school days. I now have two granddaughters in high school. Time to introduce them to that world and beyond. Thanks for the chance. I enjoy reading anything about Henry Percy. this is a must have read – so many connections, so many characters! Didn’t realise there was a link between the Mortimers and the Tudors. Looking forward to reading about it if I am fortunate enough to be chosen. Fabulous! As a keen reader of historical fiction I’ve read all your books. I was given the beginning of my family tree and encouraged to keep digging. Imagine my surprise when I discovered all these fascinating characters as they started popping up in my ancestry! Now I’m reading them all again as they seem to have captured my imagination even more! Really enjoyed your Mortimer Society talk Anne which whetted my appetite to read your new book and even more so now knowing the new connection! Wow didn’t realise the Tudor connection, absolutely love your books and I would adore the chance to win your latest novel and lose myself again in times gone by !!! I’m agrophobic so I’m always looking for more to read, I love your books and to have a signed one would be absolutely perfect. Wow didn’t know the Tudor connection So great to have authors like you to keep us informed Thank you .Your book is now on my list . I have read all your books, including Queen of the North, at least twice. Love them so much, with so much research put into the books. I love the way you bring historical figures to life that are not as famous as say, Eleanor of Aquitaine, and give them a story, a life. Amazing!!! You normally bring strong women out of the shadows and given them character, a love life and they can be pictured. I read my books on a Kindle these days, as I can make the print as large as I like and I can rest the Kindle on a cushion to save my arthriticky hands pain, but I would a signed copy to keep forever. Thank you Anne for so much pleasure. I should have bren birn in England, for all my love of English history. These books so beautifully fill in the gaps between dates, places and names , and the actual people snd what they might have been like/ were like, etc. Would love to have a signed copy, even if that makes me greedy. Queen of the North will be my holiday read. A pleasure to be savoured when I can really concentrate on it and enjoy to the full. I love the intricacies of these noble families, how they all inter connect. Hope you have a huge success with it. I would love to add your signed book to my collection. I grew up spending Sunday afternoons strolling around Hampton Cour and Bushey Park. To get immersed in your books, I am thrown back and enjoy living those days all over again. Hoping you have your next novel mapped out as I can’t get enough of them. Thank you for the chance of a lifetime. Did not know of the Tudor connection (love the Tudors). Would love a chance to own this book. Thank you. Goodness! Have you whetted my appetite or not?! That sounds wonderful and I can’t wait to immerse myself in the intrigue, excitement and romance. Sounds a great read and a copy of your book would go with the other 4 of yours i have already . I love Hampton Court. There is always something to discover including the intertwined initials of Henry and Anne Boleyn. It was overlooked when all traces of Anne Boleyn were removed from the Palace. Your books bring history to life. Thank you so much. I would love to read this novel as I love history. I love reading your books and always get excited when a new one comes out. I really like that you often write about women who are not as well known from history, but still led incredibly interesting lives. I also love how engaged you are with your fans and readers, sharing bits of your own life and writing process, and responding to comments etc. I would very much love to win a copy both for myself and to loan out to family and friends. All my direct lines. I descend thru three of Edward III sons. Lionel, John and Edmund. Would love to have this book. I love historical fiction and am looking forward to reading this. That’s an impressive connection! Thank you so much for your books – they provide welcome distraction for troubled mind! I’m so happy to see that you are writing about this time in history (I’m tired of Henry VIII ) I’ve been researching the Washburn geneology and John Washburn married Margaret Poher in 1399 and probably knew Henry Percy and Elizabeth Mortimer. The Washburns lived in Wichenford Court west of Worcester and we were humbled recently to travel from the US to visit the place our ancestors lived for over 400 years. I’m sure your book will bring this time alive for me and my family! Thank you. Have enjoyed all of your books and very much look forward to reading Queen of the North. Would love to receive a signed copy. I found this article fascinating, I am very keen on medieval and Tudor history. I love historical novels, such as your books and would love a signed copy! I have my fingers crossed! I do appreciate and enjoy the research you undertake to inform your readers about the lives of our ancestors. Thankyou. I have to admit that I have never read any of your books! But I would be honored to receive the Queen of the North. Looks very Intriguing! I love how you bring history to life. I would love a signed copy of Queen of the North. Here’s hoping! Thank you for bringing this time in history alive, have enjoyed many of your books and your frequent photos and information on Facebook , as I live in Australia and not likely to get back to England the notes on Facebook with photos are a joy. Thank you for the amazing books. I just get lost in them. Looking forward to reading this one. Discovering Medieval historical novels encouraged a pursuit of Medieval history. Thank you so much for bringing your characters to life with finesse, color and historical detail. I’m such a huge fan of your books as you make the subjects and era come alive….Would be so very honored to win a signed copy. 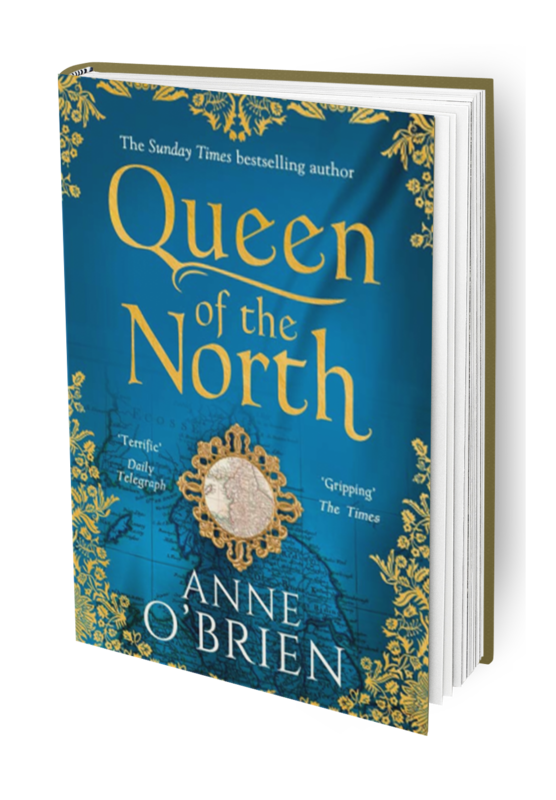 I would love to win a signed copy of Queen of the North. I very much enjoy reading your books. Would love to win this book.Have a great interest in the Tudors. Would love a signed copy of your book. I am an avid Tudor History nut, self confessed haha. Very interesting to read of this link between the families. I love that you conduct very thorough research and so believe your books provide an accurate representation of events. I love following you on Facebook, so interesting! I would love a copy of your new book! I’m still finding my family lineage through ancestory. I would love to win this book to learn about their lives and the era they lived in. Thanks for writing these books for all of us to learn more. I can’t wait to read this book. I am fascinated with this period and would love to have a signed copy as I am a big fan of your books. Thank you. Ooh, it’s my twelfth birthday soon, would be a GREAT present. Currently reading The Queen’s Choice and it is fantastic! Look forward to reading this one and especially so if I can win it ! I have already read this wonderful book but to have my own copy with your signature dear lady would be the icing on my cake. Love to win this. Love historical books . Hoping to win this. Am so looking forward to reading your book. As I think I may have an ancestry li nk to Sir Henry hotspur as he’s in my family tree. So exciting!!! I am absolutely desperate to read this book! I adore Hotspur. Thank you for the Joe Armstrong pic. I hope I’m eligible being so far away in Australia. Thanks for the opportunity. That is so interesting! I did not realise there was the connection there. Wow sounds like a fascinating read!! I love Tudor history. Since reading your first book I immediately became a fan and have since read all of them. I’m very excited to hear about your new book and look forward to reading it. Fascinating history and look forward to reading this! I am completely enthralled by medieval history and just cannot wait to read your latest book.